If you've known me any length of time, you've probably heard me mention the Red Scarf Project. I discovered it a few years ago and have tried to send at least one scarf in every year before the December 15 deadline. Since that deadline is fast approaching, I wanted to mention it again. 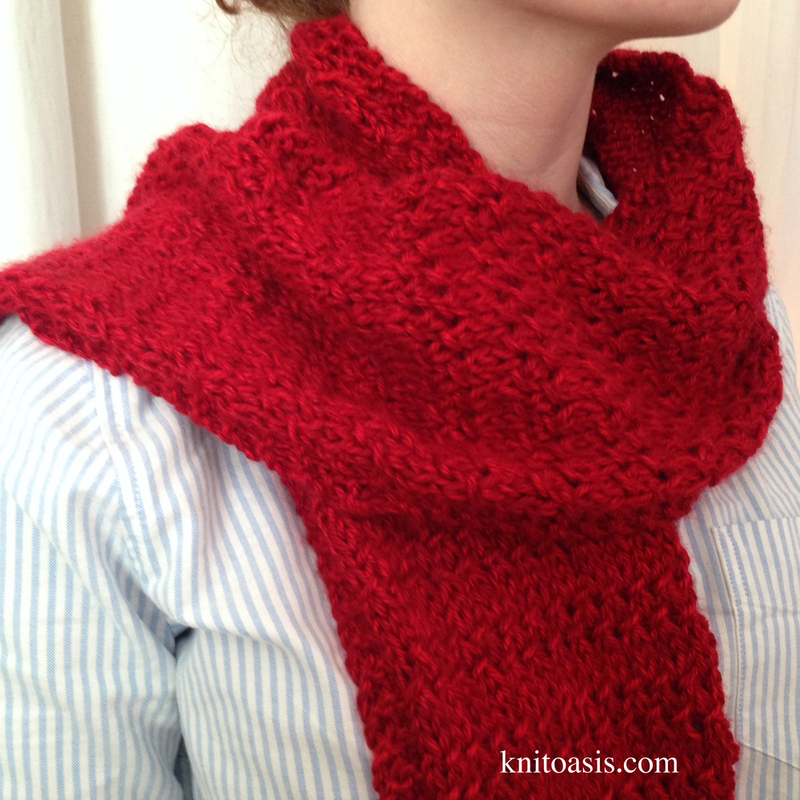 If you have some time and can cast on a quick garter stitch (or crochet, that's even faster) red scarf, please do. I will happily mail your scarf in for you, and hopefully get it there in time. The Red Scarf Project sends scarves to kids who have left the foster care system and gone on to college. Most college-bound students have a support system at home, sending love and care packages and money when needed. Students who have been in foster care need this gap filled, and the Foster Care 2 Success folks work to do just that. They are America's "largest provider of college funding and support services for foster youth," and as far as I know, the only organization that asks knitters and crocheters to contribute a tangible "hug" to send to students on Valentine's Day. Size: approximately 60” long and 5” to 8” wide. Scarves should be long enough to be wrapped around the neck, with tails long enough to be tied in the front. Style: Think unisex collegiate. Fringes are optional. Your scarf should drape, tie easily and be soft. Color: Red! However, this could mean burgundy, cherry, russet, red stripes with other colors, or multicolor hues including red. Finished & tagged: Yarn ends should be securely sewn in. For a personal touch, attach a tag saying “Handmade for You” with your first name, city, and group affiliation, if any. Donors have also included washing instructions, messages of encouragement, gift cards, and more. Contact me here or on our Ravelry group or by email if you have a scarf you would like sent in this year. Thank you for considering giving to this organization--it is one that has special meaning to me and I appreciate the chance to share it with you! My original plan for a blog post was either going to be Knitting-Related content or More Knitting-Related content, but what I did during lunch time derailed that--in a good way. Today I had the opportunity to attend the first in a Series of Discussions on Women in Leadership, hosted by our U.S. Senator Tim Scott and featuring Carly Fiorina, former chairman and CEO of HP. I was able to invite other women to attend, which made me deliriously happy because I love being able to encourage others, and I felt that this had the potential to be helpful to women in leadership positions. She also spoke of how she loves to see that look the people get when they realize they can do something they did not think they could do. She may have meant problem-solving on an executive level for a Fortune-50 company, but if there were ever a perfect description of watching someone catch on to a knitting technique, this is it. So my advice to you today, my Simple (Not Really)Knitting Tip, is to be encouraged. You may be a Senior Manager or a mom of a senior in high school, but you are a leader where you are. You can make a difference in the lives of the people around you--empower, uplift, develop, invest. The potential in a new knitter (or a new sales consultant or student or employee) is powerful and you really never know how far someone can go with some training, some respect, and some confidence. People matter. You matter. And in case no one else has mentioned it lately, I'm glad you're here.